The Infiniti Motor Company stresses the value of “modern luxury” in its efforts to allow customers to experience its premium vehicles. They boast strong driving performance, elegant design, high technology for drivers and passengers and reasonable prices. The automaker is also an innovator in terms of cultural marketing, a different approach from other automakers to meet the needs from high-end customers. One of the finest examples of this is that the company has been sponsoring various cultural events such as stage performances, exhibitions and fashion shows. The firm has signed a global partnership with Cirque du Soleil, one of the world’s most famous modern circus troupes originating in Canada, to become an official sponsor. Later, it sponsored the troupe’s performances “Quidam” in 2007, “Alegria” in 2008 and “Varekai” in 2011. In July, the firm will sponsor the local stage performance of the “Michael Jackson Immortal World Tour,” a collaboration of the troupe to commemorate the legendary pop singer. As an official sponsor, the firm will also offer its customers the opportunity to enjoy the performance. 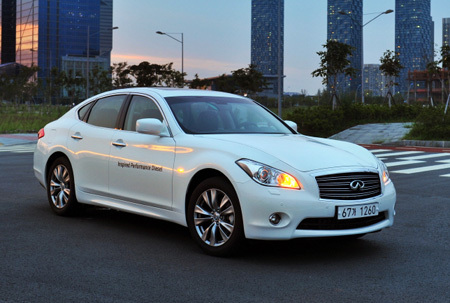 It offered two VIP tickets to customers who bought the firm’s flagship sedan Infiniti M from June to July 10. It was also an official sponsor of Pret-a-porter Busan in 2010 and 2011. The company advanced into the Korean market eight years ago, offering a rich lineup to meet sophisticated demands of local customers. Its lineup includes the Infiniti JX, EX, FX, QX, G and M.
It also became the first Japanese brand to launch diesel-powered sedans and SUVs in the local market, which are the Infiniti FX30d and M30d. It recently launched the large-sized crossover utility vehicle JX for the first time in Korea.